Providers of high-end and satellite-based communications systems seem to face never-ending demand for new services, new capabilities and greater data capacity. As a result, system designers are pushing communications hardware to operate with wider bandwidths, at higher carrier frequencies, or both. For years, a 1 GHz bandwidth provided sufficient headroom for a wide range of services. Today, however, the need to move more data in less time is driving modulation bandwidths to 2 GHz or, in some cases, 5 GHz. In addition, these bandwidths must be available at increasingly higher carrier frequencies. These changes present challenges to designers, and they also have implications for the testing and analysis of communication systems, subsystems and components. As described below, the necessary test equipment must provide sufficient frequency coverage and bandwidth as well as the appropriate modulation and demodulation capabilities. Thanks to OURSES (French acronym for rural satellite services), patients in a nursing home in south-west France were able to test out a round-the-clock satellite-based medical surveillance system. This Astrium-run project paves the way for new, innovative and operational medical assistance services via satellite, particularly in rural areas. The Missouri State Highway Patrol (MSHP) is an internationally accredited law enforcement organization with 1200 sworn officers, including officers from the Gaming and Drug and Crime Control divisions, and over 1200 uniformed civilians and support staff. MSHP is responsible for enforcing traffic laws on Missouris 33,000 miles of state-maintained highways, as well as motor vehicle inspections, commercial vehicle enforcement, drivers license examination, criminal investigations, criminal laboratory analysis and research, public education, gaming enforcement, law enforcement training, and more. MSHP works in conjunction with state, county, local, and federal agencies in the coordination of emergency and non-emergency communications. More than once, renowned photojournalist Randy Olson has found himself in a remote region of the world without adequate means of calling for help or transmitting large files when necessary. Thats why he added BGAN from Stratos to his list of essential equipment. With BGAN, Olson can quickly set up a broadband office with voice and data communications  anywhere on Earth. Investment bank Morgan Stanleys top European media-related overweight stocks include satellite operators Eutelsat and SES, plus UK commercial broadcaster ITV, pay-TV operator Sky Deutschland and advertising giant WPP. The bankers issued a major report on the state of the media industry, highlighting their top  and not so hot  stocks for investors. Satellite emerged with very high marks. Mike Antonovich participated in a panel discussion recently that encompassed the future of satellites and broadcasting. The discussion was entitled Satellites and Broadcasting: A 30-Year Warning. Mike discussed how satellites are not going away  however, IP networks are spurring growth of hybrid broadcast and media services models, models that Global Crossing Genesis Solutions is well positioned to address. He shared what he believes the future holds for these services. As most realize, the market for video services continues to grow. Industry research firm Infonetics Research forecasts that worldwide revenue for video services, including IPTV, cable video and satellite video services, will top $250 billion in 2014. And, according to the Visual Networking Index (VNI), an industry benchmark report produced by Cisco, 3D and HD Internet video will comprise 46 percent of consumer Internet video traffic by 2014. There have been a number of attempts to establish commercially operated spaceports. Most of these are based on existing space related facilities such as Cape Canaveral and White Sands. They indirectly profit from the existence of these facilities and their associated infrastructure, coupled to the desire of the owner of the facilities, i.e., the government, to achieve an optimal utilization of the assets at these locations. However, the establishment of a commercial spaceport outside these established facilities is a capital intensive undertaking with a significant threat of failure when considering the nature of the space launch market. In this article, the author presents two case studies of such commercial spaceports. One of these is the Kodiak Launch Complex, which, at a casual and first glance, seems to be a success, whereas the other is the failed Christmas Island Spaceport in the Indian Ocean off the coast of western Australia. 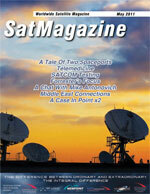 Vast stretches of the Middle East satellite market are in transition and expansion modes. Economies and governments are maturing and delivering new services to their people. U.S. troop withdrawals in Iraq have also altered connectivity demands.